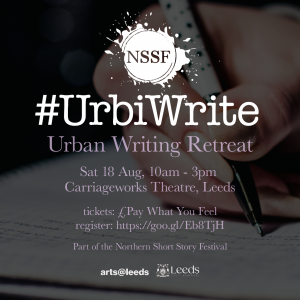 The Northern Short Story Festival and Leeds Big Bookend, in partnership with the Carriageworks Theatre, and supported by Arts@Leeds and Leeds City Council, bring you #UrbiWrite. #UrbiWrite is perhaps what you are looking for. We provide a quiet space where you can work on any written project, whether that’s a short story, a novel, poetry, play, or an essay. It’s Pay What You Feel and it’s right here in Leeds. It’s on Saturday 18 August from 10.00-3.00pm, at the Carriageworks Theatre. Come for all 5 hours or for part of the time, it’s up to you. There’s an opportunity to share your work and socialise in the bar afterwards from 3.00-4.00pm. Saturday 18 August, 10.00-3.00pm (writing retreat) with 3.00-4.00pm time to share work and socialise in the bar afterwards at the Carriageworks Theatre, Leeds. Pay What You Feel on the day but please register your attendance here. 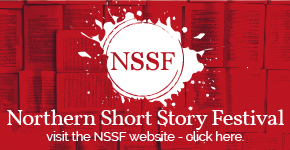 Any enquiries please email us at northernshortstoryfestival@gmail.com. If you can’t make this #UrbiWrite, join us on Saturday 27 October at the Leeds Ukrainian Community Centre for our next one. Full details here. Next story #UrbiWrite,The Urban Writing Retreat For You! Second Date Announced.